Island Properties of the Pines. Jon Wilner, Broker. 631-597-6900. 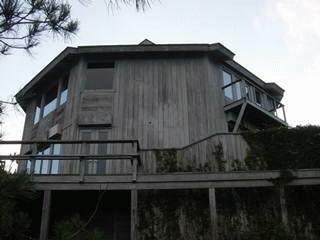 Real Estate in Fire Island Pines. SPECTACULAR OCEAN VIEWS! TOWERING ORIGINAL! SPECTACULAR OCEAN VIEWS! TOWERING ORIGINAL! SPECTACULAR OCEAN VIEWS! Boldly rising from one of the highest dune points, this beautifully maintained 3+ bedroom is one of the best examples of architect Earle Coombs' famous "Octagon House." Soaring walls of glass reflect off polished wood floors throughout. Multiple decks offer views in every direction. This corner property is beautifully landscaped and features a waterfall and Koi pond. There's also a hot tub, multi-level decks perfect for entertaining, and one of the highest roof decks in the Pines. Long season!